Oh Noes! I have to buy another panic print! Very nice!! Best of rthe 4 wood poster IMO. Like the coloring. Whats the show run? Awesome. Like the colors. Can’t wait to snag one at the Fillmore. It’s gonna be a great weekend!! Wood tour! Standing in line is going to be cold, but very worth it. Awesome Marq! Any one in going to the show that could pick up an extra for me? If that;s ok Marq? 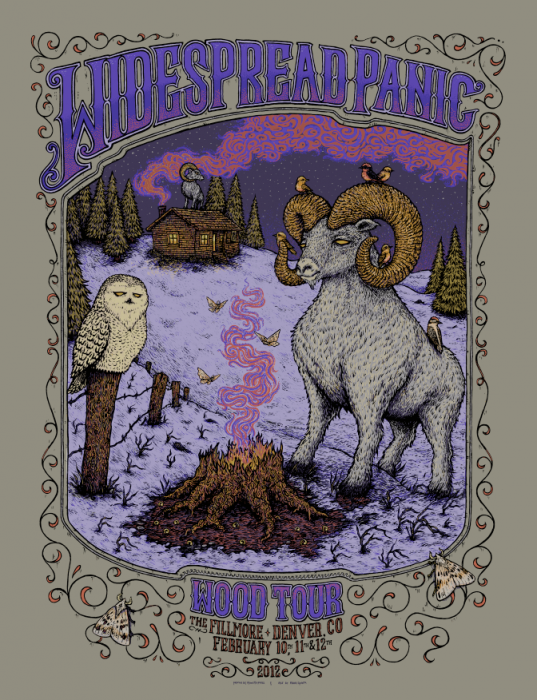 Great Panic poster and i noticed that it ties in some elements of your Fall 2010 WSP poster. That is so sick Marq! Can’t wait to get my hands on this. Any chance you’ll be in Denver for this? I live in the Bay Area, so I just wait for the bands to come to me….Colorado rules tho. Enjoy the show! i gotz a thing for anything purple! I had a friend once whose (ex) wife’s pet goat ate the roof off his restored 1966 Camaro convertible. Cant wait to see the variants!! Black paper maybe? InCredible!! WOW- a definite must have! I can’t to see this one up close!! Fantastic Marq, beautiful as always! Mr. Spusta, your art work never ceases to be amazingly awesome! cant wait, if i do get one, to have that baby framed! This poster looks GREAT. Got back from Denver, and haven’t stopped looking at it since. Off to the frame shoppe tommorow!!! Thanks Marq for another great piece. Amazing piece Marq. As a Colorado wildlife biologist and bighorn expert in addition to being a huge Widespread fan, I absolutely am smitten with this artwork. I only wish I could have had the chance to purchase one. My daughter was sick and I missed the only show I had tickets for (I assume they were being sold at the Fillmore?). Disappointed to say the least but thought I’d drop you a note and let you know how fantastic I think this is anyway. Marq, are you going to release any AE versions? I missed the poster every night. They went very fast! I love it and my wife loves rams! does first rodeo mean not willing to get in line crazy early? I’ve been going to shows for over 15 years and I got shut out in Denver as far as posters go! Getting in line early does help quite a bit. I was one of the first 50 people in the door on Friday’s show, and didn’t have any problem at all. Picked up this great piece and a Sperry. Cheers!!! 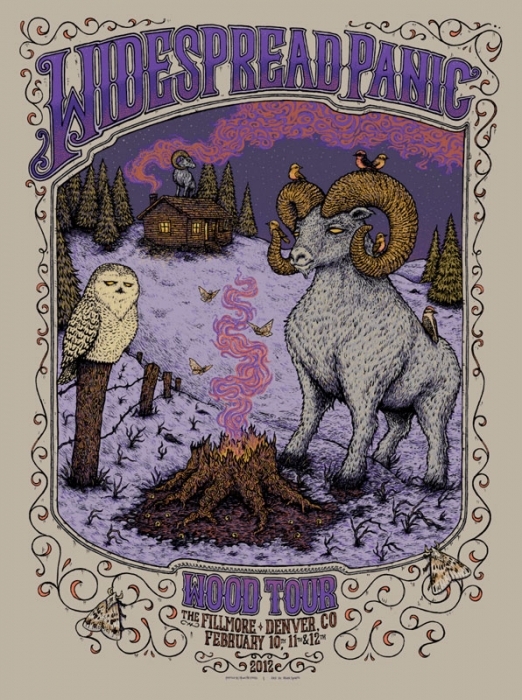 Marq – should I just mail the unisingned fillmore panic poster to you or how would yo like to handle it? Marq – you are a gentleman, scholar and a fine judege of good whiskey. Thank you so much for being so kind, courteous and helpful to your customers, even ones that are complete strangers. I’ll be a fan and supporter for life! Agree with the previous post a few up…AEs on iron please??? The pewter paper is a really beautiful touch. Really nicely done. I can’ t stop coming back to look at this piece Marq. Goodonya mate. You’re very talented artist. I am curious about AE versions of this poster. I tried every nite to get one and was shut out every nite! Most people were getting 2 do they could put on Ebay for crazy prices! Would love to have one! Love the AE Marq. Can’t wait for the sale. Thanks for all the nice comments on this poster. Just wanted to let you know that an email will be sent to announce the sale of the Artist Edition. So if you want to get the scoop, be sure you’re on the email list. Thanks Marq, but how bout randomly tossin up a few of the variants for us lunatics! Was unable to do this run of shows. My friends tried their best to get me this poster, they stood outside the venue for hours rushed to the merch table but it was quickly sold out. I love the way you captured the magic of winter and the state’s wildlife. I have the Tree Wood Tour poster thanks to my buddy Brian who was able to score one at the show. Feel free to contact me if it comes available. Have admired your work for many years. I so glad that you decided to release a AE edition of this print. I hope that i didnt miss that email…. any more info about it as I am really interested in this one!?! has the email already went out? As far as if the email has gone out about this poster i would say not yet. I think there would be other comments saying thanks +1 or i scored one can’t wait to see it in person. I have not received an email yet so i think you didn’t miss the release sale announcement. But i would check the site occasionally to see if Marq may have put it up for sale or not. Hope this was of some help to you. 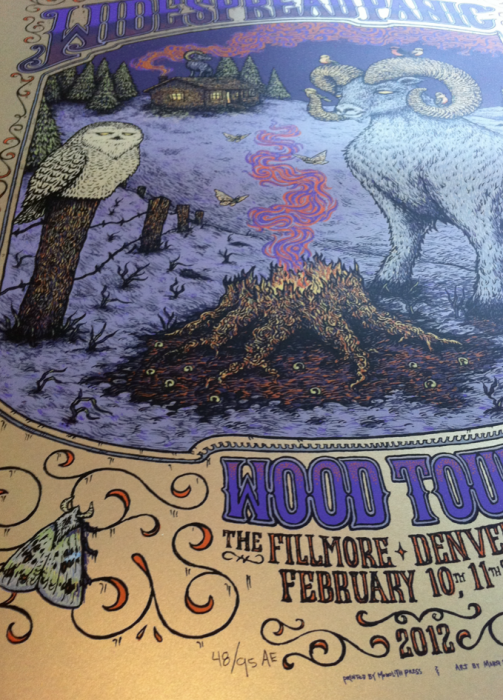 best encore of the entire wood tour belongs to denver…. Denver’s Friday encore was sick as well. Don’t be denied, up all nite, & CHUNK OF COAL! During the Halloween blizzard of ’92 we nearly hit 3 big horns coming round a corner in Boulder Canyon. Love It … Gotta Have It. Cheers! Marq, I absolutely LOVE your work! But I’m not going to lie, the suspense is KILLING me waiting for the email to announce sale of the AE version of this print. I got shut out at shows every nite:( if I miss the window on this one I’ll be broken! The “in the sun” Nirvana print will probably get obtained at the same time or shortly after. I love all the song references in that print! Especially the field of marigolds. Excellent work! Another awesome image. great art, Marq! Widespread Panic…causing widespread panic. Awesome print fo sho! People- relax, learn to read, RELAX. Awsome! Hope I get lucky! Purple Panic Summer would be my hope. Thanks so much Marq for offering these gems up like you do! I was wondering if the prints from the variant lottery have been sent out yet? Not all of them, you’ll get a shipping confirmation.